Some of you are having problems downloading the correct BASSA app. We have noticed that many of you have downloaded the wrong BASSA App. At the App Store there are a few BASSA apps which do not belong to us. 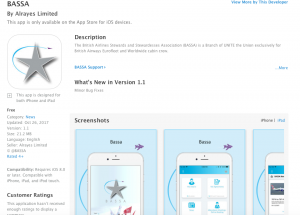 Your BASSA app will be the one that contains the BASSA logo as above (a grey star). You can also click on the link below to download the BASSA app. When you download the app you will have very limited access. To have full access to the app you will need to log in using the same details used to log into the BASSA website. If you have not received your password, you can retrieve it from the BASSA website by clicking on “Forgotten Password”. You will need your email address, staff number and Unite membership number in order to reset your password. When installing the app to your device please make sure you accept/allow to receive notifications in your settings.